After spending two glorious days in San Francisco, we crossed the Golden Gate Bridge and headed into Muir Woods for a nice little hike. We had never been before, and we found it to be beautiful in every way. It wasn't just the gorgeous trees, it was the sounds of nature and the wonderful scents. It was very hushed, very relaxing. People told me it feels like a magical place, and it does, but it also feels like a place to be very reverent. It's mystical. I also loved that, as we passed people on the trails, I heard many different languages being spoken. I found myself smiling at young families around us, as I noticed that a parent speaking to a child sounds the same no matter what language they are speaking. And child's giggle is a universal language...and a universal joy. Everyone seemed happy in Muir Woods. I know I was. Perhaps, that's part of the magic. Speaking of magic, our next stop was the little town of Sausalito! It's one of my favorite places to eat and look out over the Bay to San Francisco. There's a little Italian place, right on the water, where we love to sit on the dock at a café table and enjoy great panini sandwiches with a couple of cold drinks. It's also fun to people watch and walk around visiting the little shops. Tom decided to pick our restaurant after looking at some reviews of other places in Napa Valley. The place he found was absolute perfection! We had dinner on the patio at Bistro Don Giovanni, surrounded by beautiful fields of grapevines. It is a true Italian restaurant with fabulous food and wonderful service! I didn't struggle with the extensive wine list, as I know what I like in wine, but I did struggle with the menu. Our server was extremely helpful and gave great suggestions based on the things we said we like to eat. Our meal was served in four, delicious courses and our dessert was the perfect finale! After our meal, we took a stroll around the property. The landscaping was so beautiful! There were fruit trees around the building and a lovely garden. There were also roses everywhere. Even the parking lot was amazing because everywhere you looked, fields of grapevines stretched out in front of you with a backdrop of majestic mountains. Amazing. Hotel Tonight found us a wonderful place just a couple of blocks from Sonoma Plaza. We had a lovely room with a fireplace and our own balcony. A delicious breakfast was included, along with afternoon cookies. We were pleased to be given two discount cards for two wine tastings on the plaza, and it was a nice touch to be escorted to our room and shown where things could be found and how things worked. The name of this special place I will return to is the Inn at Sonoma, and our gracious host that day was a lady named Linda. 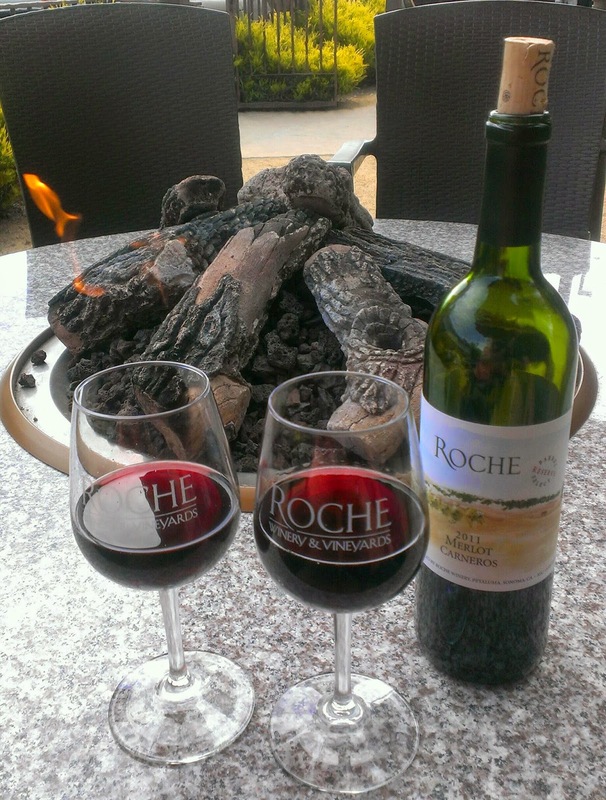 I discovered Roche Winery a couple of years ago with a friend of mine, Robin. We had gone to San Francisco and decided to take a wine tour. It was a wonderful experience, and I learned a great deal. I also tasted a good deal of different wines from different wineries. Or, as Robin always says, I educated my palate. When our tour shuttle arrived at Roche, I had no desire to go anywhere else. I had never had a tasting where I truly liked every wine I tasted. I also loved the way their tasting room was set up right off the plaza. You could taste at the outside bar and enjoy your wine at a patio table, you could also go inside and do some barrel tastings, as well as shop for different wine products. Did I mention the people there are really wonderful? They are. Roche is a family-owned winery, and they make you feel like family when you're there. Oh, and one more thing. You can't buy Roche anywhere but Roche. I've never belonged to a wine club, never thought I'd want to, but I have been a member of Roche Winery's club for over two years now. Yes, it's that good. I knew Tom, who had never been, would be enjoy experiencing Roche first hand. He's always loved the wine that comes to the house, but he'd never had the experience of enjoying an afternoon at the tasting room on Sonoma Plaza. We both had a wonderful time and enjoyed making some new friends out on the patio, as we enjoyed some wine and appetizers. All in all, it was a few lovely days spent in Wine Country!